Singapore’s sprawling supertree-sprouting Gardens by the Bay are rapidly nearing completion – and one of the three indoor gardens, Bay East has already opened to the public with rave reviews. Designed by Grant Associates, the gardens are currently gearing up for their grand opening this June – hit the jump for fresh new photos of this amazing project! With gardens inside the swooping glass and steel exoskeleton and outdoors, a whopping 54 hectares of carefully manicured gardens feature plant species from around the world make up the entire Bay South. The new dome maintains a constant cool-dry Mediterranean climate and it will house bottle trees, olive trees, and date palms, giving visitors a taste of the Mediterranean Basin, South West Australia, South Africa, and Central Chile – as well as views of the remarkable Singapore skyline. 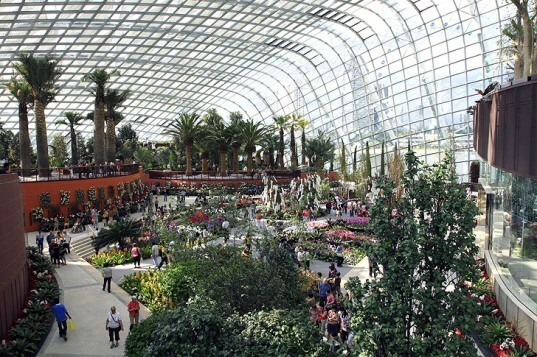 The other sector of Bay South is the Cloud Forest, another grid-shell conservatory that represents tropical regions. The conservatories are expected to achieve 30% savings in energy consumption due to energy-efficient cooling technologies that works in tandem with the natural rising of hot air. The gardens also generate energy by using horticultural waste as biofuel, creating electricity to power the Flower Dome’s systems. The waters from the complex are naturally filtered through the inclusive Dragonfly and Kingfisher Lakes. The lakes catch run off, filter it through aquatic plants, then redistribute the recycled water to be irrigated throughout the complex. We have already marveled at the Gardens by the Bay’s Supertrees, a series of artificial tree towers that rise around the property. Comprised of a living skin of bromeliads, ferns and climbing flowers, the Supertrees harvest rainwater and collect solar energy that illuminates the Supertrees at night. 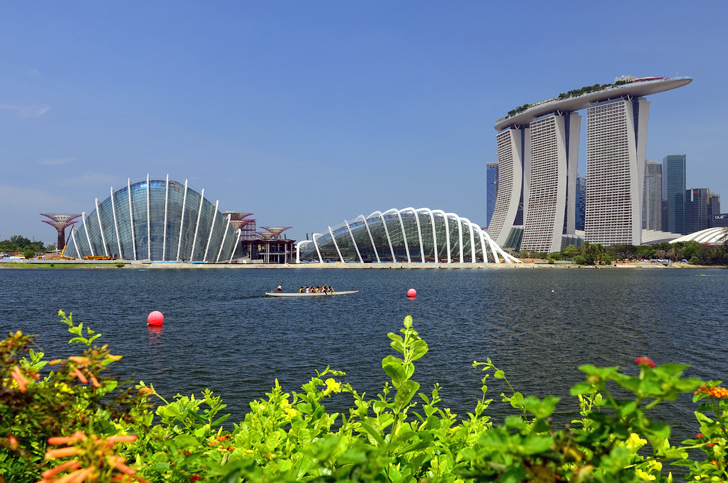 With official opening in June of 2012, the Bay South is sure to secure Gardens by the Bay as a national icon of environmental and botanical wonder. Singapore’s sprawling supertree-sprouting Gardens by the Bay are rapidly nearing completion - and one of the three indoor gardens, Bay East has already opened to the public with rave reviews. Designed by Grant Associates, the gardens are currently gearing up for their grand opening this June - hit the jump for fresh new photos of this amazing project!